Tochigi Prefecture (栃木県, Tochigi-ken) is a prefecture located in the Kantō region on the island of Honshu, Japan. The capital is the city of Utsunomiya. Nikkō, whose ancient Shintō shrines and Buddhist temples UNESCO has recognized by naming them a World Heritage Site, is in this prefecture. Other famous parts of Tochigi include a region called Nasu known for onsen and local sake and ski resorts. The Imperial Family has a villa in Nasu. Nasu-Shiobara is a major Shinkansen station. Situated among the inland prefectures of the northern part of the Kantō region, Tochigi is contiguous with Ibaraki, Gunma, Saitama, and Fukushima Prefectures. The climate of Tochigi may be classified as a humid temperate zone with broad variations in temperature. Winters are arid with dry winds, while summers are humid with frequent thunderstorms. 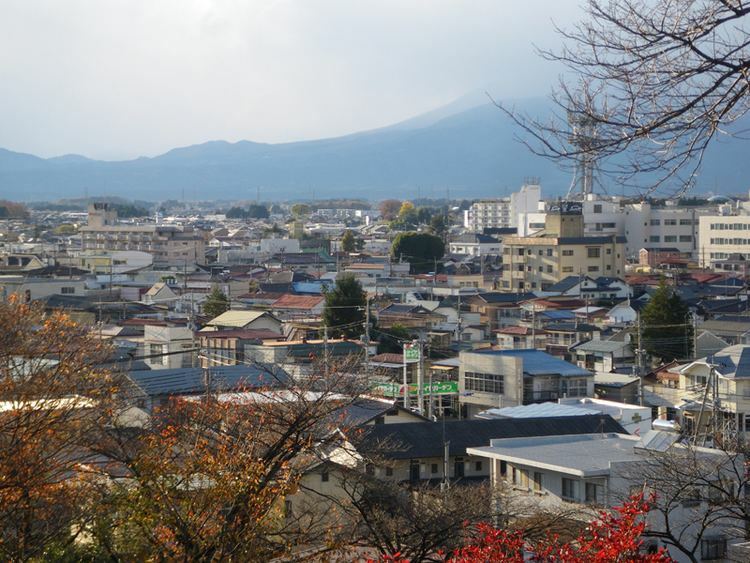 The population of Tochigi as of November 2010 is approximately 2,005,096. Located in the center of the prefecture is the largest open plain in the Kantō region. Shirane (2,578 m), Nantai (2,484 m) and Nasudake (1,917 m) mountain are in the northern part of the area. Kinugawa, Nakagawa, and Watarase River originate in this region, which flow across the Kanto plain before emptying into the Pacific Ocean. 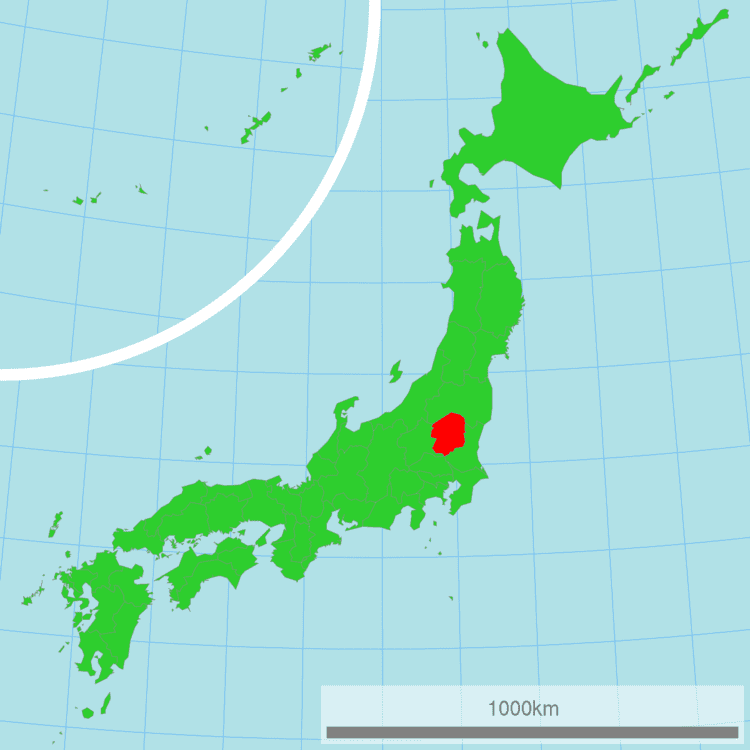 Tochigi is the 20th largest prefecture in Japan with a total area of 6,408 square km. As of 1 April 2012, 21% of the total land area of the prefecture was designated as Natural Parks, namely Nikkō National Park, Oze National Park, and eight Prefectural Natural Parks. 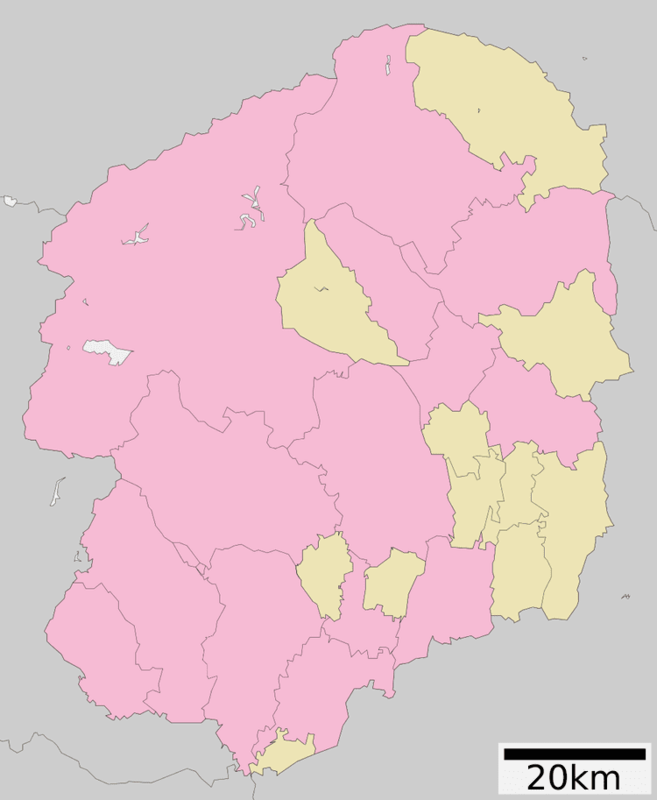 Before the Meiji Restoration, Tochigi was known as Shimotsuke Province. In the early 15th century, Ashikaga Gakko, Japan's oldest school of higher education, was re-established, holding over 3,000 students by the 16th century. Saint Francis Xavier introduced Ashikaga to the world as the best university in Japan. In the early 17th century, Japan was unified by the shōgun Tokugawa Ieyasu. After his death, Tōshō-gū shrine was built in Nikko on what the shoguns thought of as holy ground to protect and worship Ieyasu. The establishment of the Nikkō Tōshō-gū in 1617 brought Nikkō to national attention. The Tokugawa shogunate developed the Nikkō Kaidō (日光街道, part of the major road connecting Nikkō with Edo) and required lavish processions to worship Ieyasu, the founder of the Tokugawa line of shoguns. In the late 19th century, the Tokugawa Shogunate fell and the new government established the prefectures. The prefectural capital was established in the city of Tochigi after the unification of Utsunomiya Prefecture and Tochigi Prefecture in 1873. By 1884, however, the capital was transferred to Utsunomiya. In March 2011, following the Fukushima I nuclear accidents, levels of radioactivity in Utsunomiya were 33 times higher than normal. The chief city of Utsunomiya is famous for its many gyoza specialist shops. Also located in Utsunomiya, Tochigi Prefecture has one of the largest shopping malls in the North Kantō region, Bell Mall. Located close to Tōkyō, Tochigi is home to many corporations and industrial zones, including the Kiyohara Industrial Complex, one of the largest inland industrial complexes in the country. Industrial manufacturing accounts for 36.6% of the prefecture's total output. Vehicle parts and accessories are the primary products, followed by vehicles, radios and televisions, pharmaceuticals, and wireless communication equipment. The annual gross agricultural output in Tochigi is about 274 billion yen. Rice, vegetables, and livestock are produced in the region. Tochigi is also known for strawberries, Chinese chives, and Japanese pears sold throughout Japan and exported to other countries. Approximately 55% of Tochigi is covered by forests. Mushrooms, such as Shiitake mushrooms, make up half of the forest industry, with an output of approximately 5.6 billion yen. Tochigi is home to many universities and colleges including those for science and technology, literature, medicine, education, and art. Below is an alphabetical list of some of the universities located in Tochigi. The sports teams listed below are based in Tochigi. Nikkō National Park is famous for its UNESCO World Heritage Site which was registered as the 10th World Heritage Site in 1999. This encompasses Rinnō-ji, Nikkō Tōshō-gū, Mount Nantai, and Futarasan Shrine. 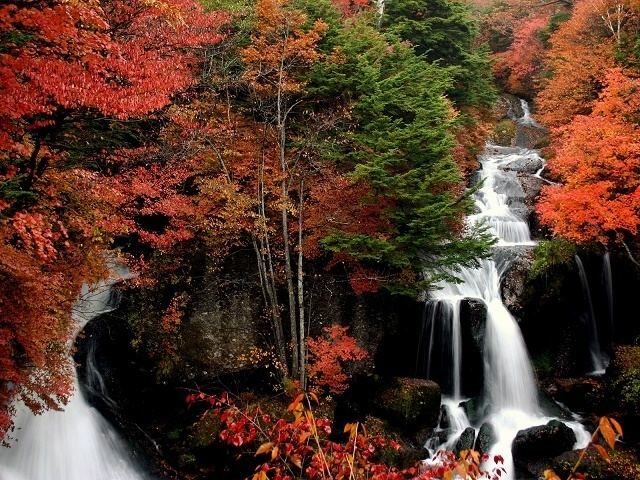 The Kegon Falls, also in Nikkō, is popular with tourists. To travel between the city and the falls, automobiles and buses take the Irohazaka, a road with dozens of switchbacks. In addition, 400-year-old Japanese Cedars (about 13,000 in total) line the famous Cedar Avenue of Nikkō for roughly 35 km, making it the longest tree-lined avenue in the world. A more recent and modern attraction is the Twin Ring Motegi Circuit race course, which hosts the only IndyCar race outside the United States. The track also hosts many other race events including Formula One and motorcycle races as well as festivals and fireworks events. Tochigi has many traditional festivals and events such as Nikkō Tōshō-gū's 1000 Samurai Procession and Horseback Archery Festival, and the city of Tochigi's Autumn Festival where doll floats are pulled around the city once every five years. Traversing the prefecture along the north-south axis and connecting to the rest of the country are the Tōhoku Expressway and the new and old Route 4. From east to west spans Route 50, connecting southern Tochigi with Ibaraki and Gunma Prefectures. Also connecting Tochigi, Gunma, and Ibaraki is the Kita-Kantō Expressway, with the 18.5 km that connect the Tochigi-Tsuga Interchange and the Utsunomiya-Kaminokawa Interchange. Portions of the Kita-Kantō Expressway are still being constructed and is set to be fully completed by 2011. The highway will link the region's other main transport arteries, the Tōhoku, the Jōban and the Kan-Etsu Expressways, providing a link to the international port of Hitachinaka in Ibaraki. The Tōhoku Shinkansen and the JR Utsunomiya Line are the main railways running north and south in Tochigi. Shinkansen runs from Tokyo Station to Oyama in south Tochigi in 43 minutes. 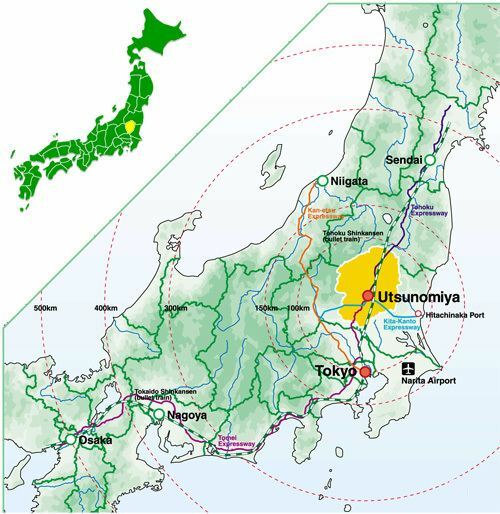 Utsunomiya can be reached by rail in as little as 48 minutes, and many parts of Tochigi are within commuting range of central Tokyo. To the east and west, the Mito and Ryōmō Lines connect Tochigi to Ibaraki and Gunma. Freight is served by the Utsunomiya Freight Terminal. Fukushima Airport is approximately an hour's drive from Utsunomiya on the Tōhoku Expressway. International and national air transportation is through Narita International Airport to the east of Tokyo, approximately three hours by vehicle from Utsunomiya.